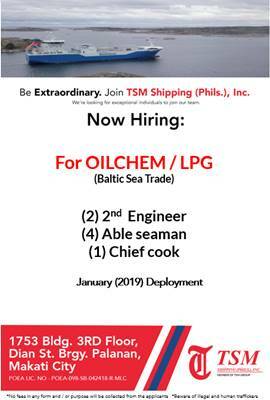 SEAMAN JOB INFO - TSM Shipping (Phils), Inc updated hiring Filipino seaman crew join to oil chemical tanker, LPG ship with Baltic sea trade deployment January 2019. We are currently looking for hardworking and passionate Filipino seafarers. Find and get the job today. Visit us at 1753 TSM Building, (3rd Flr. ), Dian Street, Barangay Palanan, Makati City. Interested applicants may also send their resume to tsmrecruitment@tsmphil.com.ph or reach us through Tel. Nos. (02) 860 75 29 /860 75 59. 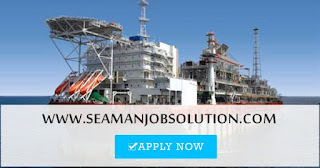 0 Response to "Able Seaman(4x), Chief Cook(1x), 2nd Engineer(2x) Join January 2019"